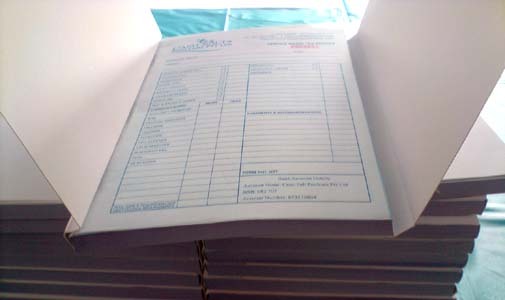 Free Artwork, Email Proofs, One colour Printing on 60gsm NCR, Numbering, Perforation,Binding with Hard Cover. b. If client does not specify, writing page will be white, and copy page will be light blue. c. Numbering is "No.1234567" or "1234567" (7 digits only) or no numbers. Number is from 0000001 or you required number. f. Supply ready for print artwork, please set 10mm margin on each side.